SunTour derailleurs have a two-letter date code. On rear derailleurs the code is stamped on the back side of the inner parallel arm. On front derailleurs it is stamped on the back side of the inner cage. The first letter represents the year. Larry Osborn and I believe O (Oh) is 1972, V is 1979 and A is 1984. As with Shimano, the second letter is the month code, where A is January and L is December. The earliest Suntour derailleur I have found with a code is marked OF. 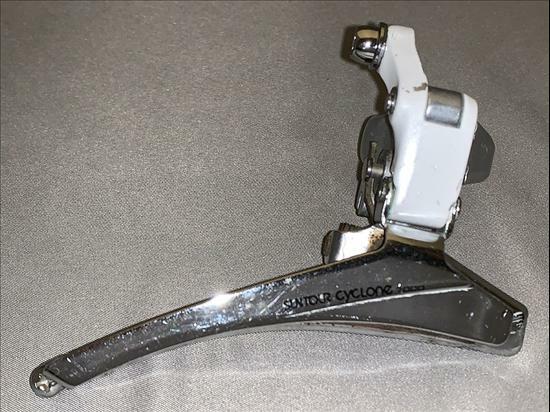 A rear derailleur marked OD (corresponding to April of 72) was reported by Leighton Walter. I have a bike that dates from between 1970 to 1972 that has the original SunTour derailleurs. These derailleurs do not have date codes on them, so I believe the coding started sometime between 1970 and April of 1972.